Welcome. Travel and explore with us in our Airstream. Nuestra casa es su casa! We had been tent-campers for years. It allowed us to stay close to nature and enjoy simple delights. We thought we'd be tent-campers for life. Tenting is what tenters like best! However, we noticed that as we improved over the years, tending did not. The ground got harder and colder, the dirt was somehow dirtier, the bugs more unpleasant, and the tent wetter / draftier. 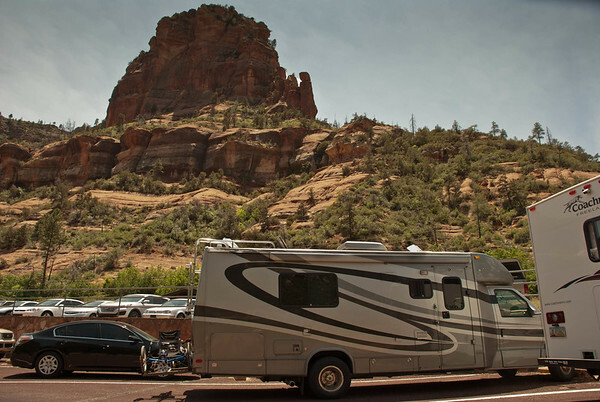 Then in 2013 we inherited "The Phoenix," a 25' Class B+ Phoenix Cruiser model 2551 motor home from our parents. Our brother insisted we accept the Phoenix, as he was already camping in a beautifully remodeled 1950's Airstream. Thanks, bro, you were sooo right! So what's with the Airstream? 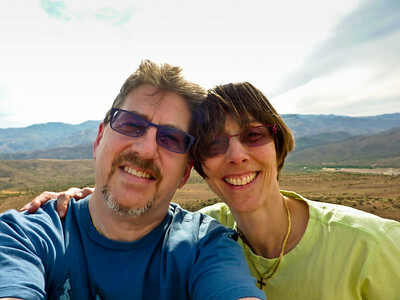 Before settling down in Phoenix, AZ and switching to the smaller Phoenix Cruiser, our parents spent many years living full time in a 34' Airstream Sovereign trailer and then an Airstream Land Yacht motor home. After discovering how much we loved RV camping via the Phoenix, we decided to move up and over to an Airstream. Thus, Rocinante, whom we pull with a 2014 Ram 1500 outfitted for towing. She's a wonderful travel trailer, more spacious than the Phoenix even though she's roughly the same length. Best of all, everything you hear about how easy it is to tow one of these silver bullets is absolutely true. Driving the Phoenix was a constant exercise in control, whereas towing Rocinante is so easy its ridiculous. We have less free time to roam in 2016 than last year (e.g. one of us has an office job this year), but we'll still be sharing our adventures with you here. Thanks for joining us! We love to hear from humans and can be reached via the Contact link in the menu at the top of each page. Feel free to also leave comments about the blog pages or the photos. * Yes, they still make them in Jackson Center, OH. * Rocinante has a Front Bedroom (FB). As you look at the rear of the trailer in this picture, you are looking at our dining / living area. * While the model name suggests a length of 27 feet, she's actually 28 feet 1 inch long - a silly inch longer than the official 28 foot model. * Airstream offers various trimlines, and Rocinante is roughly in the middle of that range. 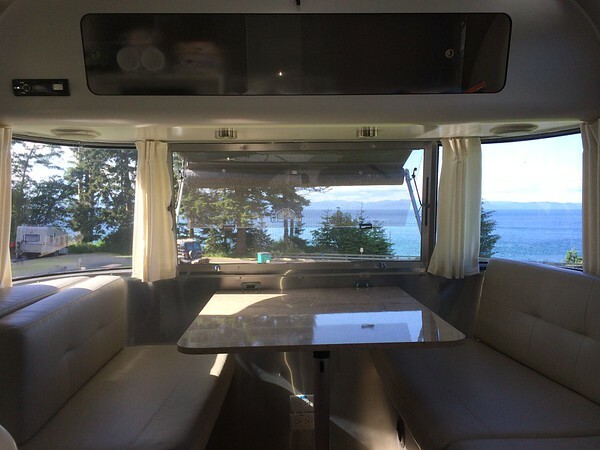 * You can get into an Airstream for a lot less (or more) than you might expect, depending. After all, they've been making these trailers for 80 years, and with care they can last several lifetimes. So, pick your price point, how much work you want to do to make it yours, and how much you're willing to spend on the process. If you want it, there's an Airstream out there somewhere with your name on it! 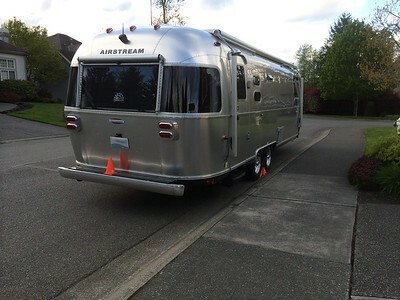 Here's the blog post that tells the story of how we named our Airstream. We were just thinking how much we'd like to share our latest adventures with you. We hope you enjoy your visit and that you'll drop in now and then to see what we've done lately! We're an intrepid camping duo (it's just the two of us since our golden, Skipper, passed away in February of 2016). When we're not in traveling in our Airstream, we live in the Pacific Northwest. As expats from NY/NJ, we now live amongst the rain, clouds, moderate temperatures and Seattle freeze (hint: unlike Sasquatch, it's real). The freeze is offset to some degree by all things artisinal, including coffee, beer, food, micro-distilleries, and liberal politics. What you have in front of you is a photo blog of our travels. Mostly pictures most of the time, and a few stories along the way. This is a grand experiment for us, and it will evolve as we do. As amateur photographers, we've shared our adventurous life via pictures for years on Smugmug. The blogging, she is newer. If you're interested in using Smugmug for your photos and/or blog, click here to learn more. We don't do ads, though we do have affiliate links on our "Airstream Hacking" page. Still, if you feel inspired to leave a small tip to help pay our cost for hosting photos and this blog on SmugMug and / or renting our domain, please be our guest. Thanks for your support!